The SOB2 is one of my most popular and successful holsters. I designed it over thirty years ago as an efficient, unobtrusive mode of carry for gun-shop owners in France who, by law, are required to carry a weapon whilst conducting business. Since then, it has been adopted worldwide by airport security staff and sky marshals, BGs, law-enforcement personnel, and DEA operatives. Ironically, with the current climate of tension at airports, it is enjoying a renewed level of success after having been rediscovered by airport security personnel and sky marshals, It is particularly suitable for women in plainclothes where conventional belt carry holsters may present problems of concealment. It provides an unorthodox but effective form of covert carry, using the natural hollow adjacent to the small of the back as a place of concealment. Wet-blocking and heavy hand-molding to the weapon it is designed to carry provide more than adequate retention, yet the radical rake allows for an extremely fast, natural draw -- as easy, in fact, as reaching behind you. This is a task-specific holster and like all task-specific holsters, common sense dictates that there are some obvious situations where its use would not be appropriate, such as when seated in a vehicle, wearing several layers of clothing, etc. In short, any given set of circumstances that would prevent you from reaching behind you. In all other situations, however, whether for principal weapon or for backup, this mode of concealed carry is hard to beat. A rear protective tab is not available with this holster as its place is taken up by the rear belt slot. However, the tab is not really needed, as the pistol doesn't come into contact with the body. 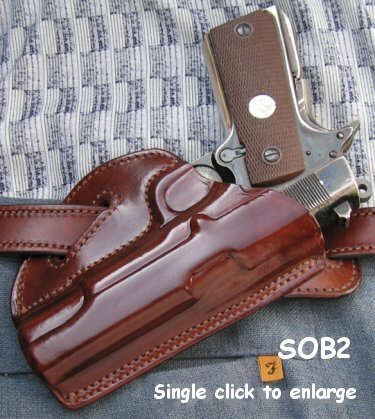 Check the availability of the SOB2 for your weapon by consulting the Holster Selector Chart. Available for belt widths of 1 1/4" or 1 1/2" only in Saddle Tan, Cordovan, or Black (Click here for colour samples). For an action demonstration of model SOB2, ensure your browser is Java-enabled, wait until this page has fully loaded ("Document Done" or "Done" in Status Bar) then Click this link.